The first load of steel was delivered to our Long Beach Facility in early October, and its arrival initiated the process of fabricating the individual modules that would eventually come together and form the completed barges. The strategy for barge construction was conceived long before the first trucks unloaded; although a project of this nature had not been attempted before, Curtin Maritime’s innovative team was ready to take on the challenge. The barges were then hauled at Marine Group Boat Works in Chula Vista to complete Phase 2; this is when the real work began. The barges were bisected down the center line by hand and rolled apart. One side remaining fixed on blocking while the other was rolled to starboard on a dolly system. Once apart, the remaining 1.3 million pounds of centerline, hinge and rake modules could be installed. The overall alignment of all the components was critical for both hinge operation and proper sealing of the hopper. Both cranes from above and hydraulic jacks on the underside were used to guide the modules, including the 56K pound hinge boxes into place for welding. While module install was in full swing, painting, piping and the completion of the engine and hydraulic systems were done. From initial haul out of barge one to launching of barge two, total shipyard time was only 10 weeks. The well sequenced assembly along with the hard work of our crews made this possible. 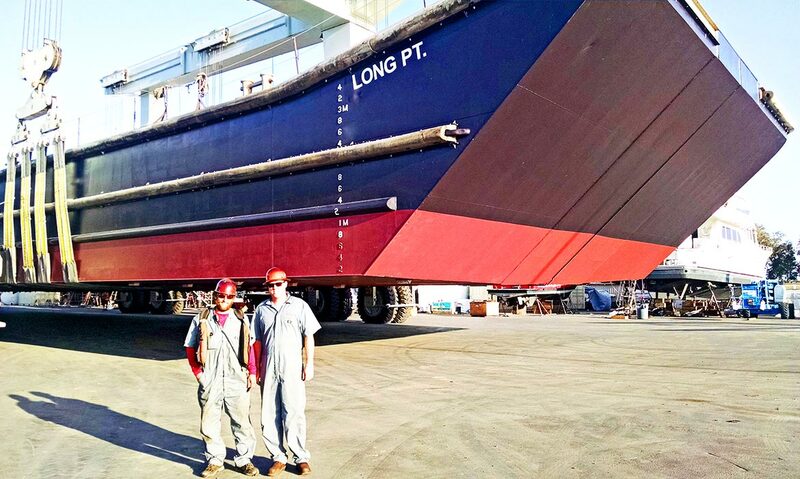 We are very proud of this project, as it a fantastic example of the full-range of capabilities that Curtin Maritime has as a shipyard and marine construction company.